I never get up early enough to get to Disneyland early enough to get an empty daytime castle photo (save on 24 hour days), so the afternoon golden hour is my next best bet. 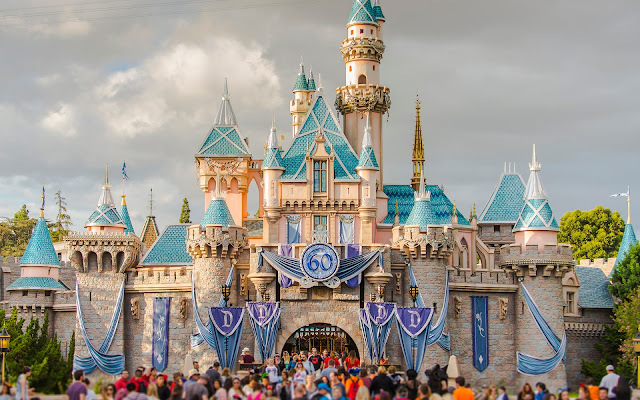 Even though those "pesky people" are always in the shot, I still enjoy the view onto Sleeping Beauty Castle, draped in its 60th Anniversary decorations. I must admit that I've gotten used to the ornate and lavish decorations, and even though there are some pretty gaudy parts, they no longer appear quite as gaudy as before. And there are some elegant and beautiful pieces, especially with the bunting, banners, medallion, and castle roof toppers. I've got another ten months to enjoy this, until the 60th anniversary celebration concludes at the end of next summer. So I suppose I shall! Busy Sleeping Beauty Castle on a cloudy but golden afternoon.